Meni Rosenfeld is one of key figures in the Israeli cryptocurrency community. Scientist, developer and entrepreneur, he has a degree in mathematics. Meni is the author of the “colored coins” concept and the Head of several IT startups. Nevertheless, public work is now his main activity. Meni Rosenfeld has been the undisputed leader of the Israeli Bitcoin Association (IBA) for almost five years now. He talked on the organization in detail in an interview with Bitcoin Magazine. IBA promotes cryptocurrency in the country and builds a dialogue between crypto enthusiasts, society and authorities. 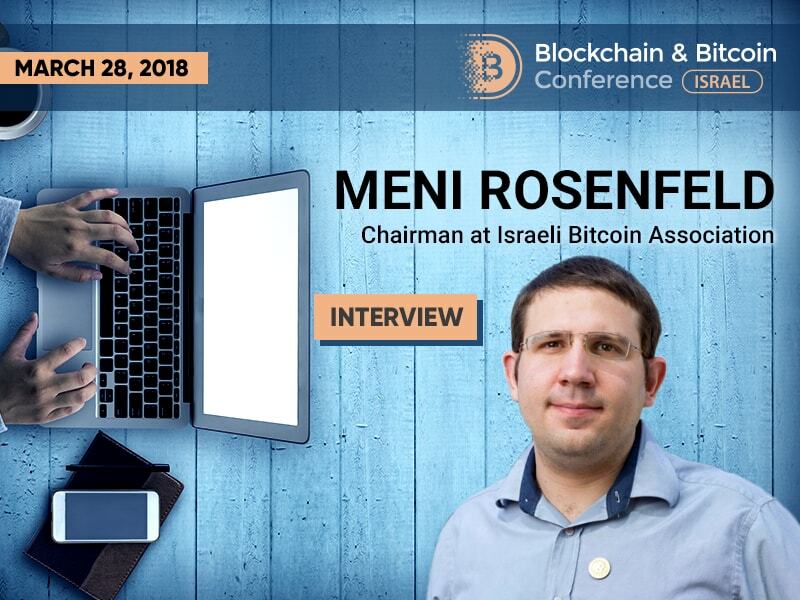 The Press Service of Blockchain & Bitcoin Conference Israel talked with Meni Rosenfeld on the development of the Association and acceptance of cryptocurrencies in Israeli society. BCI: M-r Rosenfeld, you participated in the development of so-called “colored coins”. How popular is this technology now? M.R. : Colored coins, as originally envisioned, are not very popular currently, and many of the companies that pioneered its development are now focusing on other projects. However, the core ideas behind it have gained huge momentum, and are being deployed using other technical means. Among these is of course Ethereum, which greatly generalizes the features of Colored Coins, and is now used frequently (for better or worse) for ICOs. There are other projects for asset registry on the Bitcoin blockchain. BCI: Please tell us about the current structure of Israeli Bitcoin Association, that you are head of. How many participants are there? What is the main activity? Do you interact with the government of the country? M.R. : The IBA consists of a board of 5 directors, a staff of ~10 contractors and volunteers (mostly part-time), about 200 registered, paying members with voting rights, and a greater community we interact with of roughly 30,000 Bitcoin supporters. We have a wide variety of activities – discussion with government to further appropriate regulation, handling the press, holding events, publishing educational material, nurturing the community, and acting as a hub to facilitate collaboration between different entities. BCI: What is the Association's global mission? What major goal would you like to achieve in the future? M.R. : The IBA's goal is to maximize the benefit obtained by the people in Israel from the Bitcoin and Blockchain technology. Right now the main barrier for further adoption is lack of regulatory clarity, and solving that is almost 1% of Israelis own some amount of bitcoins a major focus. BCI: Do you keep in touch with bitcoin associations in other countries? If so, tell us about the most beneficial communication. M.R. : We interacted more frequently with other associations in the past, but this has become of less importance as our local community grew. Bitcoin has matured, and the challenges we are facing have become more unique. BCI: Do you continue to work with www.bitcoin.org.il, where you were the author previously? If so, what is the role almost 1% of Israelis own some amount of bitcoins of this website for the Association today? M.R. : The website bitcoin.org.il predates the IBA, but is now its official website for content on Bitcoin, cryptocurrencies and other blockchain applications (as opposed to iba.bitcoin.org.il, which is about the IBA itself). It is currently not as well-maintained as we would like, as our focus is on more popular platforms for disseminating information, such as Facebook. However, we are working on upgrading it and increasing its relevance. BCI: How is bitcoin accepted by Israelis today? Can you provide statistics, what percentage of Israelis use cryptocurrency? M.R. : We estimate that almost 1% of Israelis own some amount of bitcoins. Unfortunately, as is the case elsewhere, most of the interest is speculative. There are about 100 businesses accepting Bitcoin – not too bad for a small country, but most of them don't get a low of Bitcoin-paying customers. Most people prefer to hoard them. BCI: You participate in a panel discussion on the impact of blockchain on the banking sector at Blockchain & Bitcoin Conference Israel. Tell me, do you see this influence on the banks of Israel? Do you notice any changes today due to the use of blockchain and cryptocurrency? M.R. : Many banks in Israel profess interest in the blockchain technology, but are hostile towards Bitcoin and cryptocurrencies. "Blockchain, not Bitcoin" is a mantra repeated by people who want to sound smart and relevant, even without having an idea what a block is or what a chain is. I like Andreas' interpretation that this is the bargaining phase of the grief process of traditional industries in light of this revolutionary change. Very frequently banks refuse to allow transfers relating to Bitcoin trade, a problem which appears to be much more severe in Israel than elsewhere. I think they are starting to realize that cryptocurrencies pose competition, and can make some of the services banks are offering less relevant. But it is not clear if their aversion to Bitcoin is due to fear of competition, or due to legitimate (yet unfounded) concern for money laundering risks. We have seen very little interest from banks in embracing the new technology, in terms of offering Bitcoin-related services.